Sometimes a decision, seemingly based on a whim, can be a pivoting factor in a person's career and life. It was such a decision that brought artist Rie Muñoz to Juneau, where she became one of Alaska's most recognized artists. In 1951 Muñoz was planning a vacation. Looking at a map, she randomly drew a line from her home in California to the farthest point she could visit on her limited budget. She opted to go to Alaska, traveling up the Inside Passage by steamship, and fell in love with Juneau. She gave herself one day-until the boat was scheduled to depart-to find a job and a place to live. She landed a newspaper job and Alaska has been home to Muñoz ever since. During her years in Alaska, Muñoz has lived in a variety of small Alaska communities and has held many jobs. Among them were journalist, teacher, museum curator, artist, and raising her son. 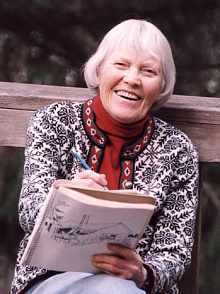 One of her most memorable positions was teaching school on King Island in 1951, where she taught 25 Eskimo children. The island was a 13-hour umiak (a walrus-skin boat) voyage from Nome, an experience she remembers vividly. Muñoz studied art at Washington and Lee University in Virginia, and at the University of Alaska-Juneau. She received the University of Alaska's Honorary Doctorate of Humanities Degree in May of 1999. Her paintings, prints and reproductions are carried by galleries throughout the U.S. and Canada. She has had many solo watercolor exhibits in Alaska, Oregon and Washington State. She has devoted herself full time to her art since 1972. "My artwork can best be described as expressionism. The term applies to work that rejects camera snapshot realism, and instead, expresses emotion by distortion and strong colors. My paintings reflect an interest in the day-to-day activities of Alaskans such as fishing, berry picking, children at play, crabbing, and whaling. I am also fascinated with the legends of Alaska's Native people. While I find much to paint around Juneau, most of my material comes from sketching trips taken to the far corners of Alaska. I've taught school on King Island in the Bering Sea, traveled and sketched almost every community in Alaska."